Just how does one become a cultural icon? Perhaps one of the main requirements is achieving a mixture of success and visibility in a local community and on a national stage simultaneously, maintaining the balance, and dying before it all falls apart. Too much attention either way and one or the other audience will dismiss you as either hopelessly provincial or too damn big for your own britches. It helps to move away, but visit frequently. Think Bobby Zimmerman, aka Bob Dylan. Not frequent enough? Ok, think David Ericson. Despite the larger world’s fickle attitude toward humble origins, the hometown forever proudly claims the star’s production and early care. In Ericson’s case they would be right to do so. Collectively, we are the humble log cabin he grew up in. Virtually fatherless, poor, and physically sick as a child, his precocious artistic abilities were recognized and nurtured by relatively well-heeled, benevolent Duluthians. They were his first audience beyond his family, the first to envision him as a cultural icon, and they financed his first step onto a larger stage. Knute Heldner’s 1931 painting of fellow Duluth painter and Swedish immigrant David Ericson. 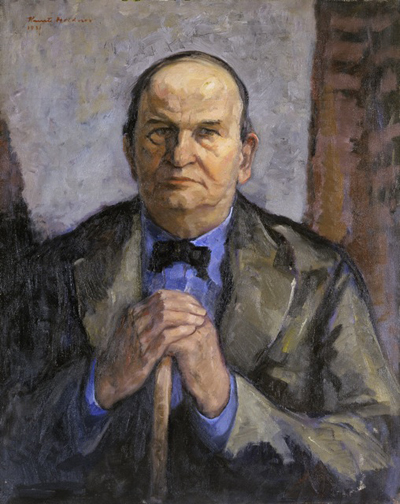 In 1931, Ericson and Heldner painted reciprocal portraits in France. Ericson had been to Europe five or six times, including extensive stays in France. Not counting his birth, it was Heldner’s first time there. See the final page of this story for Ericson’s painting of Heldner. (Image: Tweed Museum of Art, University of Minnesota Duluth). 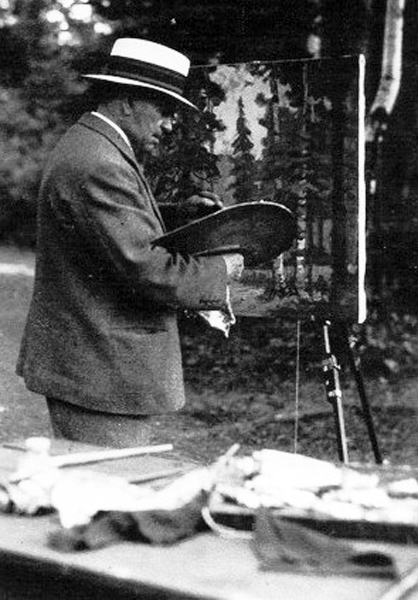 A poor Swedish immigrant made good, David Ericson is arguably the best painter and the most-widely recognized visual artist to come from Duluth in the late 19th century. That may not have been the case had Eastman Johnson, whose 1860s visits here yielded a stunningly honest series of Ojibwe portraits, stayed much longer. As it was, Ericson became Duluth’s portraitist at an early age, first drawing crayon likenesses of family and supportive townsfolk, later painting oils of over two dozen prominent citizens—a veritable who’s who of Duluth, from 1895 to 1930. An entire section of the Tweed Museum book is devoted to these portraits and biographies of the sitters, including Charles F. Johnson, Clara Stocker, John H. Darling, Eugene Bohannon, Marcus Fay, Clara and Chester Congdon, Henry Truelson, Guilford Hartley, and this hometown’s namesake, Daniel Greysolon Sieur du Luht. David’s father was Karl Erik Wilhelm Eriksson, who arrived by himself in Duluth in 1872, part of a mass immigration of 60,000 Swedes spurred by crop failures and several starvation years. Karl Eriksson hailed from Motala, on the Gota Canal in Ostergotland Province, where he was a laborer and blacksmith’s helper and where, in 1869, David Axel Ericson was born. 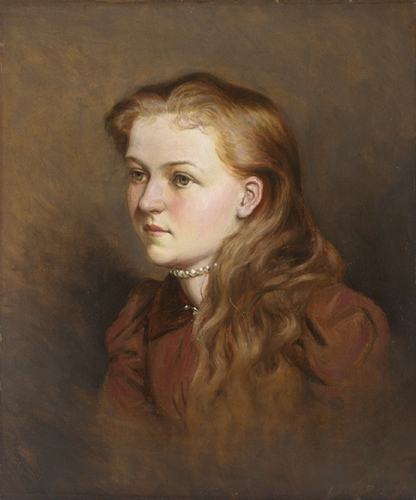 By 1873, the whole family was living in Duluth and included David’s mother, Augusta Engman Eriksson (1832–1905), his maternal grandmother, and siblings Charles, Alfred, Josephine, and the infant Enoch (ages 12, 10, 7 and 1, respectively). A sister, Victoria, was born in Duluth in 1875. Life had been difficult in Sweden, and it was no easier for Karl Ericson to support a large family in frontier-like Duluth. He was often absent from his family, in part due to itinerant farm labor, but also due to his chronic alcoholism. Like all rags-to-riches tales, the Ericson story is based in these humble origins; from this poor Swedish immigrant family in far-flung Duluth, who would expect a sophisticated and celebrated artist? David had a keen interest in animals and nature that later contributed observational skills to his developing draftmanship. Childhood accounts tell of him selling a portrait of his grandmother to the family grocer for a quarter, cutting intricate scenes out of paper, and modeling figures from the red clay so abundant around Duluth. At age eight, David developed an infection in his right knee, and was forced to use crutches. Soon unable to walk, he was bedridden for two years before the leg was amputated when he was eleven. This extended illness separated David from the normal physical activities of childhood. Confined to bed, an observer of others’ play and the activity of the busy harbor, he would have to create a life and a future through imagination. He read and drew, modeled in clay and painted. As is true of a surprisingly large number of visual artists, his extended illness led him toward the pursuit of art as a serious career. Ericson’s earliest surviving work, Superior Street, Duluth—which appears at the top of this page—is dated 1882, when he was 13 years old. It pays homage to Duluth and to his first and arguably most important patron and teacher, Emilie Sargent, later Mrs. Frederic W. Paine. 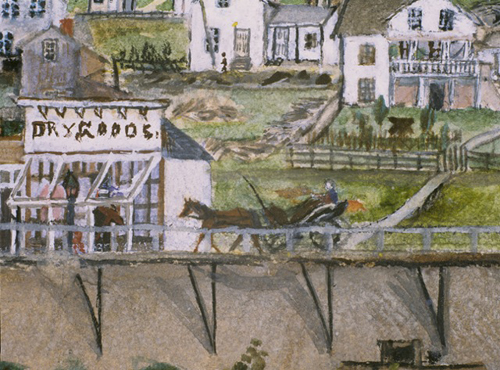 Surrounded by an obsessively detailed view of Duluth’s main thoroughfare, Miss Sargent is shown driving west in a horse carriage, presumably from her home in the “suburb” of New London, toward Ericson’s home on Minnesota Point, then the poorest section of town. Emilie Sargent and others were frequent visitors of homebound patients, including David Ericson. Along with books and food, Emilie brought him art supplies, gave him lessons in watercolor painting, and took him to her family’s home where he first saw original artworks. Sixty years later (1942) Emilie Sargent Paine’s son Roger, who had befriended Ericson, received Superior Street from Mrs. Afton B. Hilton (nee Emiline Johnson). She was also a friend of Ericson, and the daughter of Charles Johnson, a key early supporter of the artist. Roger wrote to Emiline Hilton, “I really can’t tell you how delighted Anna and I are to have David Ericson’s ‘Duluth in 1882’. …It seems to be so intimately connected with Mother’s [Emily Sargent’s] early life in Duluth. It is about that year  that David lost his leg while living in the house on the point. Mother [Emilie Sargent Paine] was present and though no one else could bear to touch David’s amputated leg, she went out herself and buried it in the sand. Anna and I are very fond of Mr. Ericson and will treasure it as one of his first paintings.” Think about that the next time you go swimming on Park Point! Fitted with an artificial leg, Ericson regained health and mobility. He earned a reputation as a local portraitist, sold drawings and cut paper designs, and with the encouragement of his mother and siblings continued to study and draw from nature. Even as a relatively untrained artist, his renderings of animals and the human figure were accurate and sensitive. 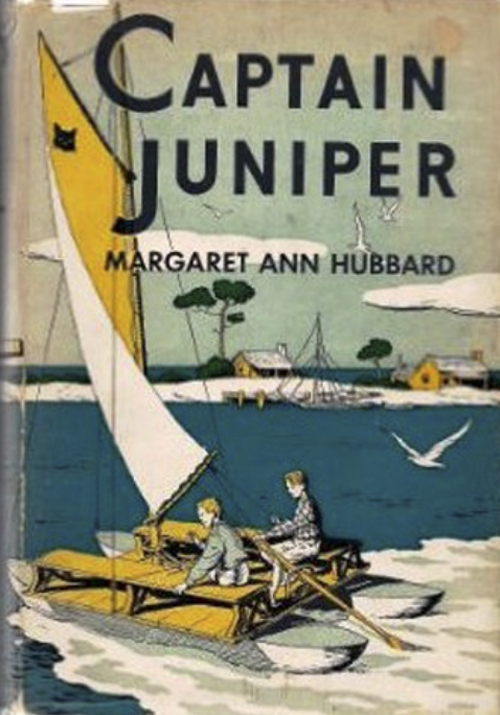 Ericson’s high school years are fictionalized in Margaret Ann Hubbard’s Captain Juniper, one of two books she wrote based on Duluth. In it, a poor but spirited one-legged Duluth teen sails a homemade catamaran from one adventure to another around the Duluth harbor and the St. Louis River estuary. 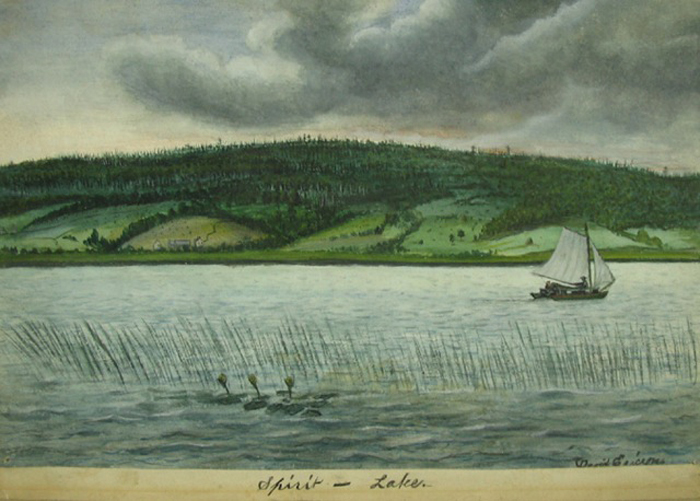 An early Ericson watercolor features such a craft sailing in what is called Spirit Lake, but is actually part of the estuary. In the book Spirit Island is literally haunted, making scary overnight camping for Hubbard’s dauntless teens. Today, Spirit Island is owned by the Fond du Lac Band of Lake Superior Chippewa. Charles F. Johnson owned a stationary and book store and was himself an amateur painter and writer. He gave Ericson additional lessons and materials, and between 1880 and 1885, he learned to paint in oils. In 1885 he was awarded a gold medal from the Art Exhibition of the Minnesota State Fair for the work Salting the Sheep. Competently drawn and painted in a Barbizon-like manner, Salting the Sheep is flavored with a healthy dose of adolescent literalism, presaging the narrative pathos of some later works. The 16-year-old Ericson positioned a “black sheep” slightly apart from the flock, staring directly at the viewer. Did this represent his absent father? Or did it symbolize the young artist himself, a teenage amputee with artistic aspirations? 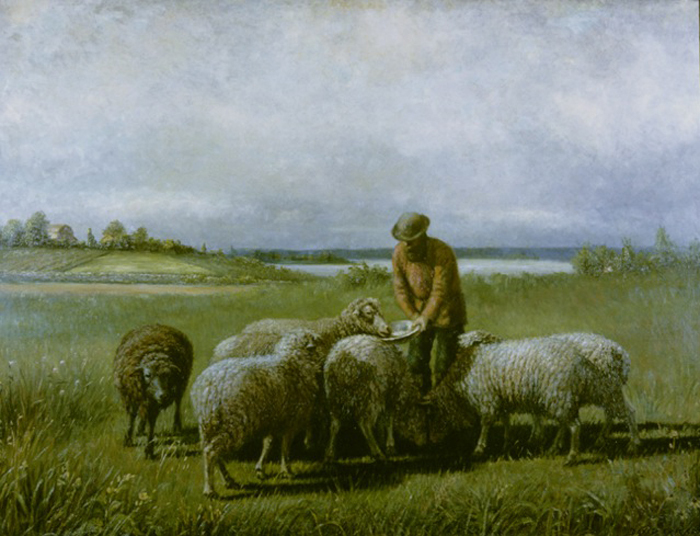 Ericson’s other paintings of this subject, including a version painted as late as the 1920s, feature a lone sheepherder and a similarly errant animal. Salting the Sheep earned Ericson his first recognition from outside Duluth, convincing family, local mentors, and perhaps himself, that he could succeed on a national stage. “After this award, friends decided Duluth was ‘not big enough’ for Ericson. 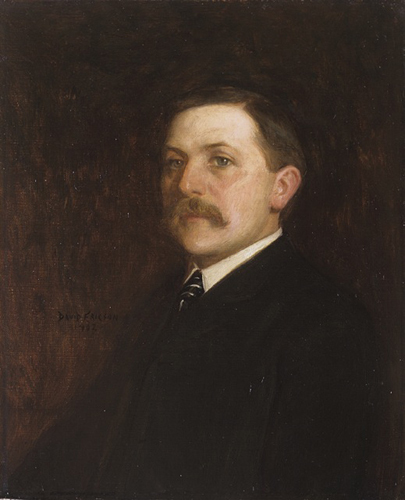 Led by C. F. Johnson, a stationer and art devotee, and A. M. Miller, wealthy retired lumberman, his admirers arranged matters so he could go to New York.” In 1887 at age 18, Ericson left Minnesota.